Built for customer success by customer success leaders. Catalyst is a Customer Success Platform (CSP) built by an experienced group of industry leaders. Our founder built an effective Customer Success organization for one of the fastest growing cloud companies in the world. 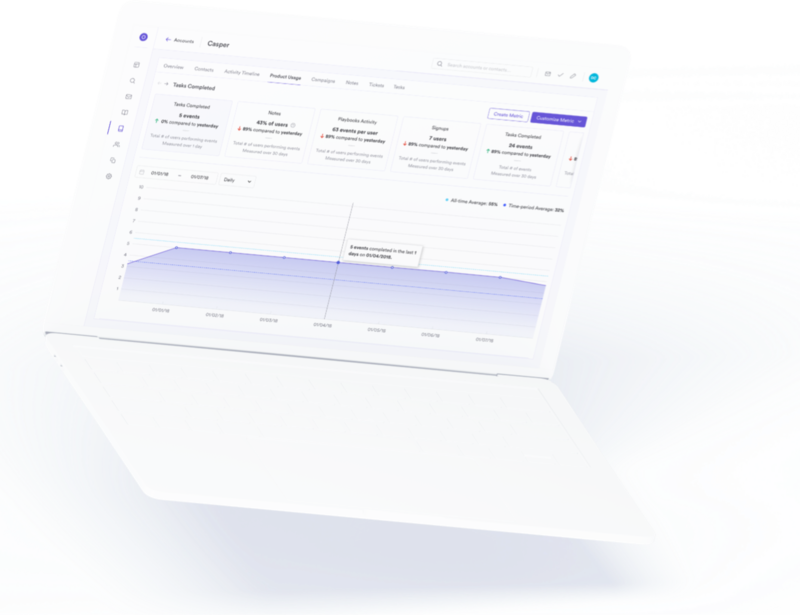 Whether you are managing a few large enterprises or hundreds of smaller accounts, Catalyst adapts to your workflow to intelligently help you build more human relationships. Signs of customer churn risk begin with user behavior. With Catalyst you can configure formulas to track the metrics that matter most to your business. This allows you to identify churn risk preemptively, respond accordingly and keep your customers happy. All in one place. Task manager is the ultimate tab killer. Customer Success Managers are proficient jugglers, tossing tabs, programs, metrics, email and notes across their screens. Not to mention the hours spent to log data and customer interactions into Salesforce. Task manager consolidates email, notes and reminders so all your tabs and programs can come together on one screen. Then Review Mode allows you to automatically log all of your customer interaction in Salesforce. If you’ve ever had to bounce between Salesforce, emails, and note documents all while on a client call, you know just how valuable this is. Catalyst gives you access to all your customer data in one convenient place. Catalyst lets you define conditions and results that help you move customers through their life-cycle journey. Playbooks adapt to your workflow, whether you’re onboarding new customers, setting up anti-churn programs, or even planning upsell opportunities. We've designed playbooks to integrate with third parties like Salesforce and Mixpanel so we can track any changes and know exactly when to act. Catalyst is the perfect campaign platform for Customer Success teams. It's designed to counter potential churn, prepare customers for onboarding and automate the drip campaign process. Tokens allow you to personalize your emails so customers don't feel like they're talking to robots and are easy to use across templates in order to target specific industries, verticals or segments. Create stronger connections by building lists that segment your customers based on criteria, filters and data points. Now CSMs can bypass product managers and engineers to procure lists of customers with specific feature needs or recently submitted tickets. This allows CSMs to target and communicate with customers quickly and efficiently. Easy 1-click integration with the most used apps for Customer Success. Bring in the customer data you want to see in customer 360 profiles, such as Zendesk, Mixpanel, Segment, and much more. Or access any other customer data you need with our API that’s coming soon.